How does a search engine work? Let’s find out – by building one! Search engines have become the gateway to the modern web. How often do you know exactly which page you want, but you search for it anyway, rather than typing the URL into your web browser? Like many great machines, the simple search engine interface - a single input box - hides a world of technical magic tricks. When you think about it, there are a few major challenges to overcome. How do you collect all the valid URLs in existence? How do you guess what the user wants and return only the relevant pages, in a sensible order? And how do you do that for 130 Trillion pages faster than a human reaction time? I’ll be some way closer to understanding these problems when I’ve built a search engine for myself. I’ll be using nothing but Python (even for the UI) and my code will be simple enough to include in this blog post. There will be three parts to this. Let’s start building a machine that can download the entire web. I need a known URL to start with. I’ll allow webmasters and other good citizens to submit URLs they know about. I’ll store them in a database (I’m using Anvil’s Data Tables) and if I know the URL already, I won’t store it twice. I’ve also made it possible to submit sitemaps, which contain lists of many URLs (see our Background Tasks tutorial for more detail.) I’m using BeautifulSoup to parse the XML. I’m in good company by allowing people to submit URLs and sitemaps for crawling - Google Search Console does this. It’s one way of avoiding my crawler getting stuck in a local part of the web that doesn’t link out to anywhere else. """This method is called when the button is clicked"""
Because it’s a Background Task, I can fire off a crawler and download all the pages I know about in the background without blocking the user’s interaction with my web app. That’s all very well, but it doesn’t really crawl yet. The clever thing about a web crawler is how it follows links between pages. The web is a directed graph – in other words, it consists of pages with one-way links between them. That’s why it’s such a wonderful information store - if you’re interested in the subject of one page, you’re likely to be interested in the subjects of pages it links to. If you’ve ever been up ’til dawn in the grip of a Wikipedia safari, you’ll know what I’m talking about. So I need to find the URLs in the pages I download, and add them to my list. 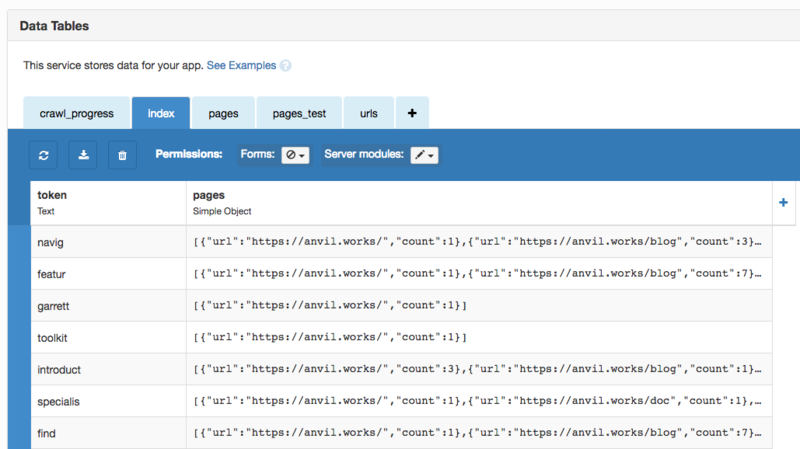 BeautifulSoup, the brilliant HTML/XML parser, helps me out again here. I also record which URLs I found on each page - this will come in handy when I implement PageRank. The crawler has become rather like the classic donkey following a carrot: the further it gets down the URL list, the more URLs it finds, so the more work it has to do. I visualised this by plotting the length of the URL list alongside the number of URLs processed. The list grows initially, but the crawler eventually finds all the URLs and the lines converge. It converges because I’ve restricted it to https://anvil.works (I don’t want to denial-of-service anybody’s site by accident.) 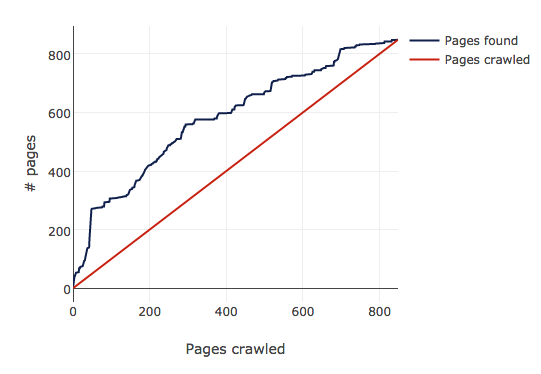 If I had it crawling the open web, I imagine the lines would diverge forever - pages are probably being added faster than my crawler can crawl. By the time it has finished, there’s a nice crop of page data waiting for me in the pages table. Time to implement search. I’ve thrown together the classic “input box and button” UI using the drag-and-drop editor. 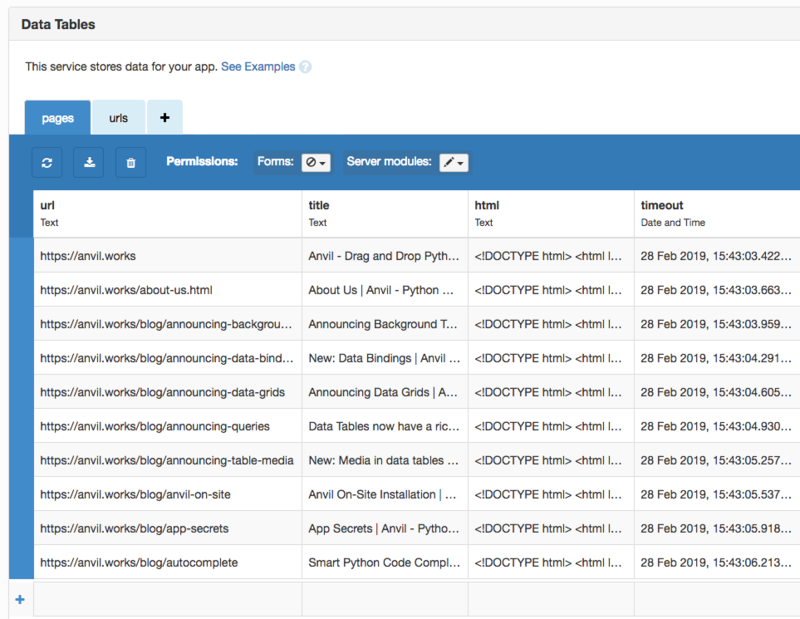 There’s also a Data Grid for listing the results, which gives me pagination for free. Each result will contain the page title and a link. The most basic search algorithm would just break the query into words and return pages that contain any of those words. That’s no good at all, and I can do better straight away. I’ll remove words that are too common. 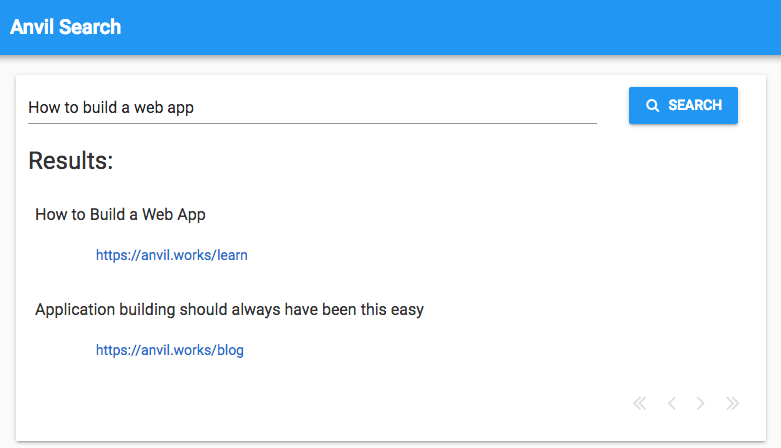 Let’s say a user enters ‘how to build a web app’. 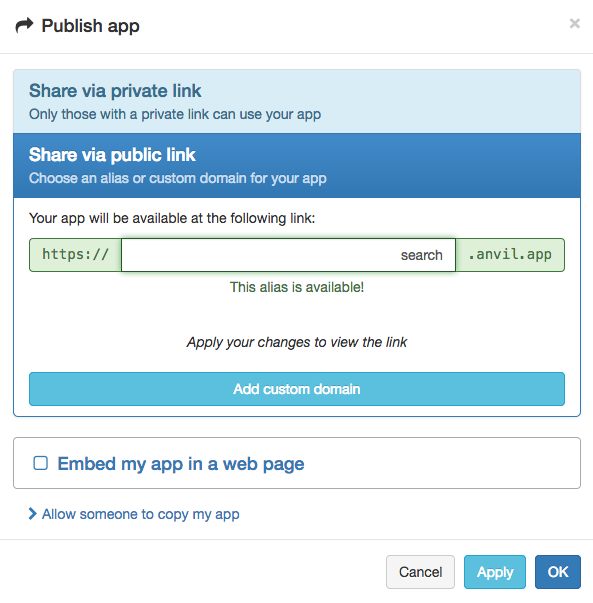 If a page happens to contain exactly the text ‘how to build a web app’, it will be returned. But they would also get pages containing the text ‘how to suckle a lamb’. So I’ll remove words like ‘how’ and ‘to’. In the lingo, these are called stop words. I’ll include words that are closely related to those in the query. The search for ‘how to build a web app’ should probably return pages with ‘application builder’, even though neither of those words are exactly in the query. In the lingo, this is called stemming. Later on we’ll talk about indexing and tokenization, which gets to the nuts and bolts of how to optimise a search. But for now, I have a working search engine. Let’s try some queries. For each stage in its development, I’m going to run three queries to see how the results improve as I improve my ranking system. Each query is chosen to reflect a different type of search problem. I’ll only look at the first page of ten results. Nobody ever looks past the first page! ‘Plots’ is a fairly generic word that you would expect to show up all over the place in technical writing. The challenge is to return the pages that are specifically about plotting, rather than those that just use the word in passing. The first result is Using Matplotlib with Anvil, which is definitely relevant. Then there’s the reference docs, which has a section on the Plot component. And result number nine is the original announcement dating back to when we made Plotly available in the client-side Python code. But there’s also a lot of fairly generic pages here. They probably mention the word ‘plot’ once or twice, but they’re not really what I’m looking for when I search for ‘plots’. ‘Uplink’ differs from ‘plots’ because it’s unlikely to be used by accident. It’s the name of a specific Anvil feature and it’s not a very common word in normal usage. If it’s on a page, that page is almost certainly talking about the Anvil Uplink. If you’re not familiar with it, the Uplink allows you to anvil.server.call functions in any Python environment outside Anvil. So I’d expect to get the Using Code Outside Anvil tutorial high up the results list. It shows up at position four. I also get Escape Hatches and Ejector Seats, which mentions the Uplink as one of Anvil’s ‘Escape Hatches’. And at number 10 we have Remote Control Panel, which uses the Uplink to run a test suite on a remote machine. It’s good that all three of these show up, but it would be better if they were more highly ranked. The rest of the results probably talk about the Uplink in some way, but the Uplink is not their primary subject. This is included as an example of a multi-word query. 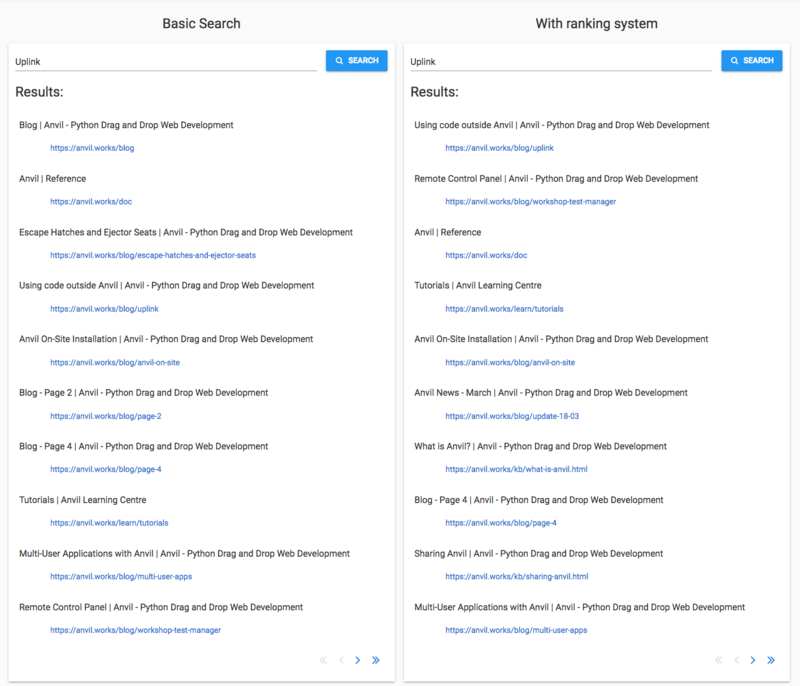 I’d expect this to be harder for the search engine to cope with, since the words ‘build’ and ‘Python’ are going to be used a lot on the Anvil site, but a user typing this in is specifically interested in Python dashboarding. 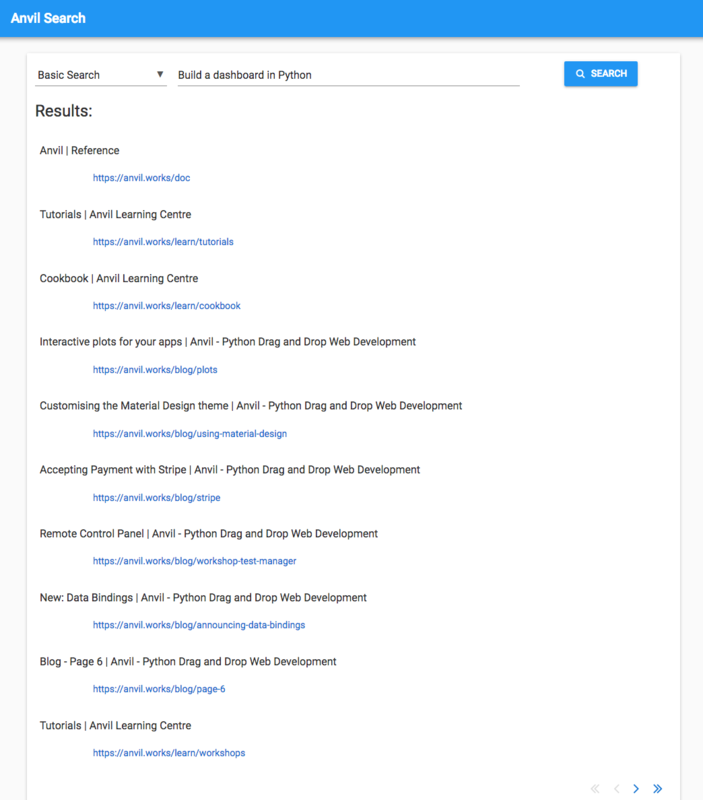 There are two pages I would expect to see here: Building a Business Dashboard in Python and the Python Dashboard workshop. Neither of these appear in the results. 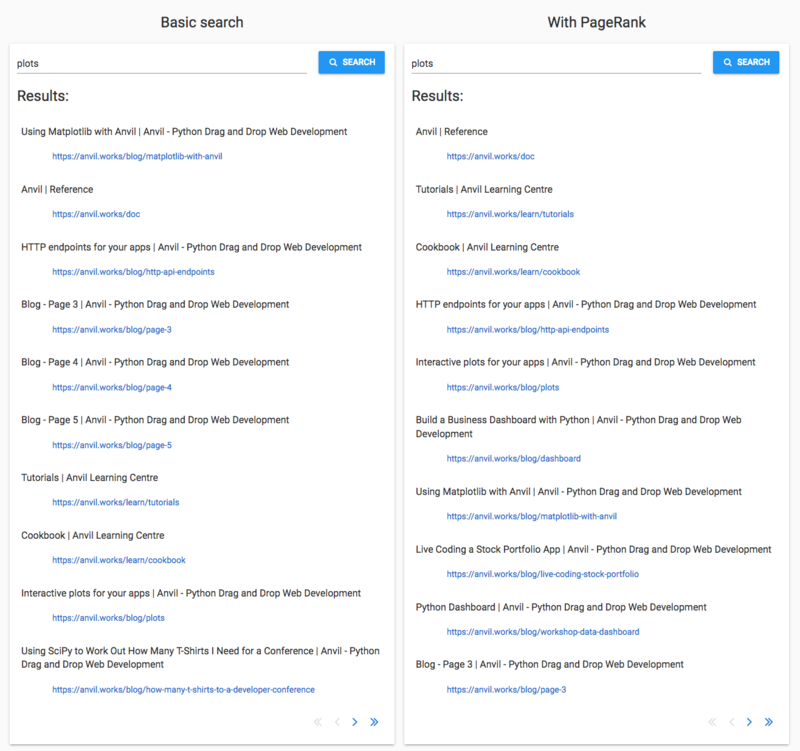 A few of the pages are tangentially related to dashboard building, but generally the signal appears to have been overwhelmed by the noise introduced by the words ‘build’ and ‘Python’. The basic search engine I’ve put together does manage to get some relevant results for one-word queries. The user has to look past the first few results to find what they’re looking for, but the main pages of interest are there somewhere. It gets confused by multi-word queries. It can’t distinguish very well between the words that matter, and those that don’t. Anvil’s full_text_match does remove words like ‘a’ and ‘in’, but it obviously won’t guess that ‘build’ is less important than ‘dashboard’ in this particular situation. I’m going to make two improvements in an attempt to address these problems. First, I’ll try to rank more interesting pages more highly. Google has an algorithm called PageRank that assesses how important each page is, and I’ve always wanted to learn how it works, so now is probably a good time! I explore it and implement it in the next post. Second, I’ll take account of the number of times each word appears on the page. This will help with the ‘building a dashboard in Python’ query, because pages that just happen to mention ‘building’ will do so once or twice, whereas pages about building dashboards will use those words a lot. That gives me an excuse to explore two simple but powerful concepts from Computer Science - tokenization and indexing, which I implement in the final post. I’m building a search engine using Anvil. So far, I’ve built a machine that roams the internet digesting pages, and a simple query engine. I can make some search queries, but the most important pages don’t always show up at the top of the results. I need a way to score pages based on how important they are. I need PageRank - the secret sauce that won Google the search engine wars of the late 90s. 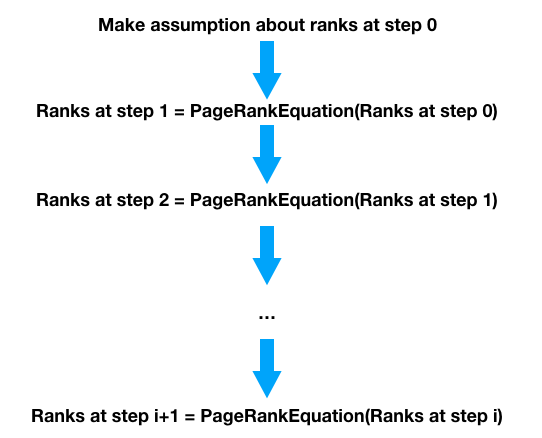 Let’s look at how PageRank works, then I’ll build a Python web app that implements it. PageRank was developed in 1996 at Stanford by Sergey Brin and Larry Page, after whom it is named. It was the ‘key technical insight’ that made Google work so well, so they kept it a tightly-guarded secret. 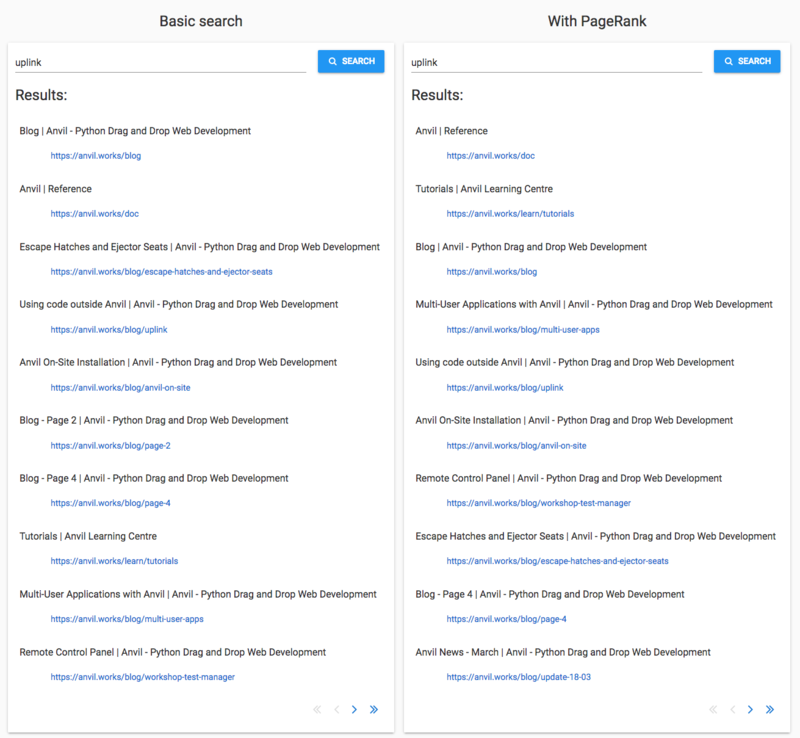 To test the utility of PageRank for search, we built a web search engine called Google. The algorithm is based on the idea that important pages will get linked to more. 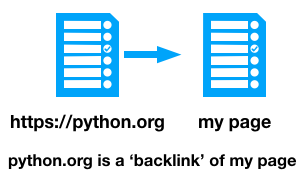 Some terminology: if python.org links to my page, then my page has a ‘backlink’ from python.org. The number of ‘backlinks’ that a page has gives some indication of its importance. PageRank takes this one step further - backlinks from highly-ranked pages are worth more. 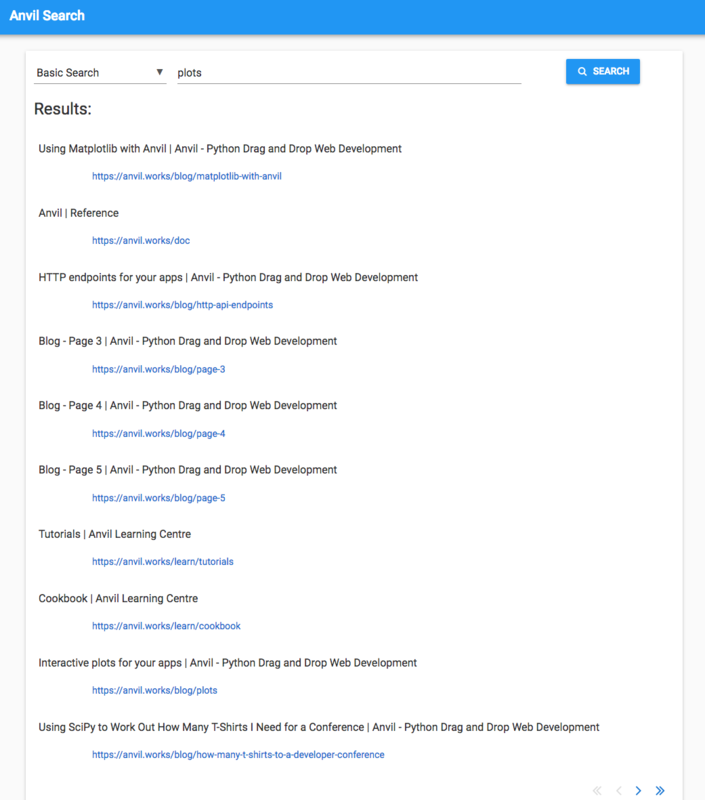 Lots of people link to python.org, so if they link to my page, that’s a bigger endorsement than the average webpage. If my page is the only one linked to from python.org, that’s a sign of great importance, so it should be given a reasonably high weighting. But if it’s one of fifty pages python.org links to, perhaps it’s not so significant. It turns out that PageRank models exactly what a random web surfer would do. Our random surfer is equally likely to click each link on her current page, and her chance of being on this page is based on the number of pages that link to it. 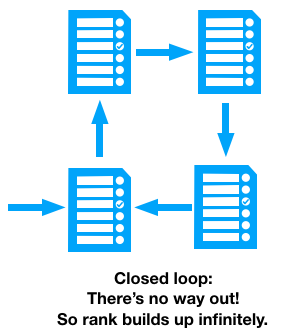 We can’t calculate this all in one go, because pages can link to each other in a loop. 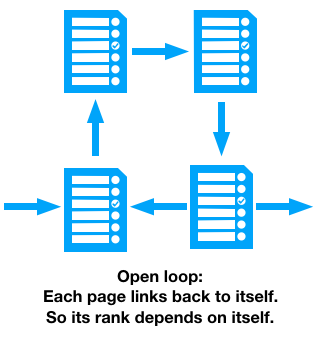 If the links between pages form a loop, we don’t know what rank to give them, since they all depend on each other’s rank. We solve this by splitting the calculation into iterations. A page in iteration i + 1 has its rank worked out using the PageRanks from iteration i. So the ranks of pages in loops don’t depend on themselves, they depend on the previous iteration of themselves. In terms of the equation from earlier, we plug the ranks from iteration i into the right-hand side of the equation, and the ranks for iteration i + 1 come out on the left-hand side. We have to make a guess about what ranks to start with. Luckily, this is a convergent algorithm, meaning wherever we start, if we do it enough times, the ranks will eventually stop changing and we know we have something that satisfies our equation. And that’s the PageRank equation! PageRank was revolutionary. The paper compares the results from a simple PageRank-based engine against the leading search engine at the time. The top result for “University” in the PageRank engine was the Stanford University homepage. The competing engine returned “Optical Physics at the University of Oregon”. First I need to calculate the backlinks for each page. My crawler has figured out the forward links from each page, so all the information is there. I just need to iterate through the pages adding ‘page X’ as a backlink on everything ‘page X’ links to. That’s the backlinks figured out. Now to set up the initial condition. The PageRank calculation gradually refines the answer by a series of iterations, so I must set the initial values to start off with. For newly-discovered pages, I’ll just guess at 0.5. 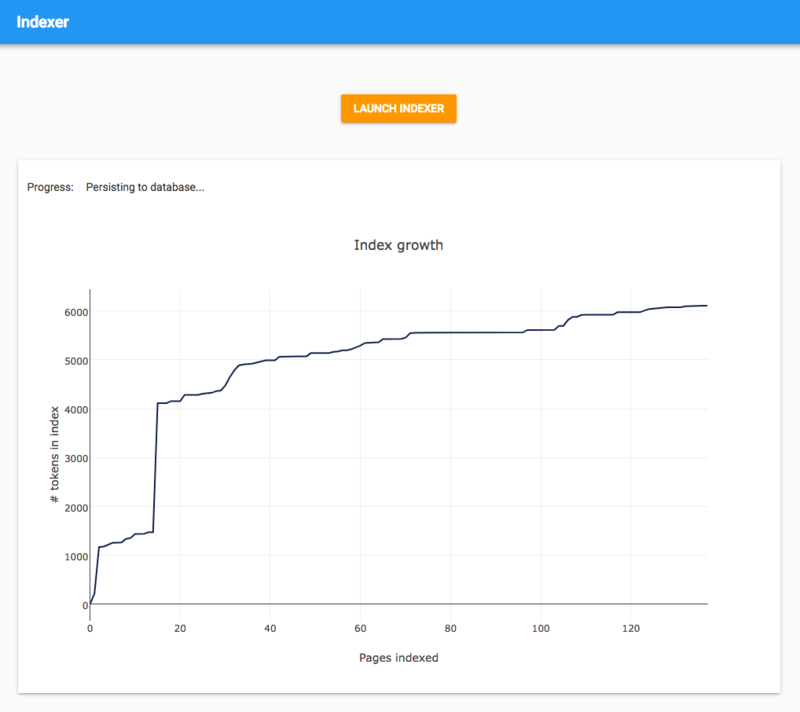 Pages I’ve seen before will have a PageRank from previous runs, so those pages can start with that old value. Now for the PageRank calculation itself. I expect the calculated values of the PageRanks to converge on the correct solution. So I want to invent a metric to tell if the calculation has stopped changing much. 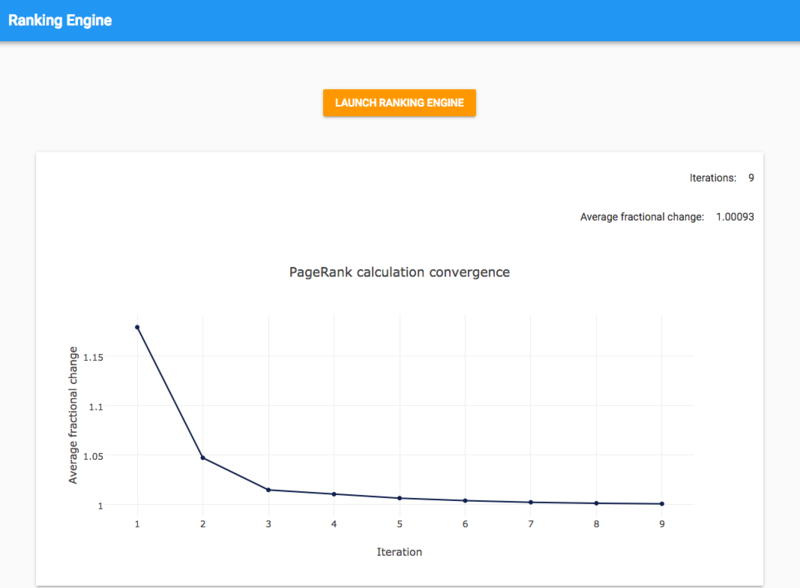 I’ll calculate how much the average page has changed in rank, and if that’s small, my calculation has converged. Inside the loop, I calculate the PageRank for the next iteration, then step the calculation on by putting the values from step i+1 into box i, and calculating the average rank change. And that’s how to calculate PageRank! I’ve left out two important details. First, the actual PageRank calculation. This is just the equation from above, but written out in Python. The CONSTANT is c and the RATING_SOURCE_FACTOR is E(u) (I’ve assumed it’s the same value, 0.4, for each page). """Calculate the PageRank for the next iteration.""" """Put 'next rank' into the 'current rank' box and work out average change.""" If you want to see the code in its natural habitat, you can clone the final app, which contains everything I’ve talked about in this series of posts. Let’s spin it up and get some ranks! I built a UI that tracks the progress of the calculation. It polls the Background Task using a Timer component and plots the convergence metric with each iteration. This means you can watch it run and see the calculation gradually converge in real time. The PageRank for each page is also shown in the diagram, as calculated by my ranking engine. The page with 3 backlinks has a PageRank of 1.5, the page with 2 backlinks has a PageRank of 0.97, and the pages with 1 backlink each from the same page have rankings of 0.63. This sounds about right. I can tune the spread of these numbers by changing CONSTANT in my code. In Part 1, I tested the basic version of the search engine by running three queries and making judgements about the quality of the results. Let’s run the same queries again to see how PageRank has improved things. ‘Plots’ is my example of a fairly generic word that appears a lot in technical writing. There are a few pages that are specifically about plots in Anvil, and I want to see whether they come up. The basic search only manages to get three of these into the top ten. The basic search also included some pages from the middle of the blog. These have been ranked lower by PageRank, so the more-relevant pages have had a fighting chance. 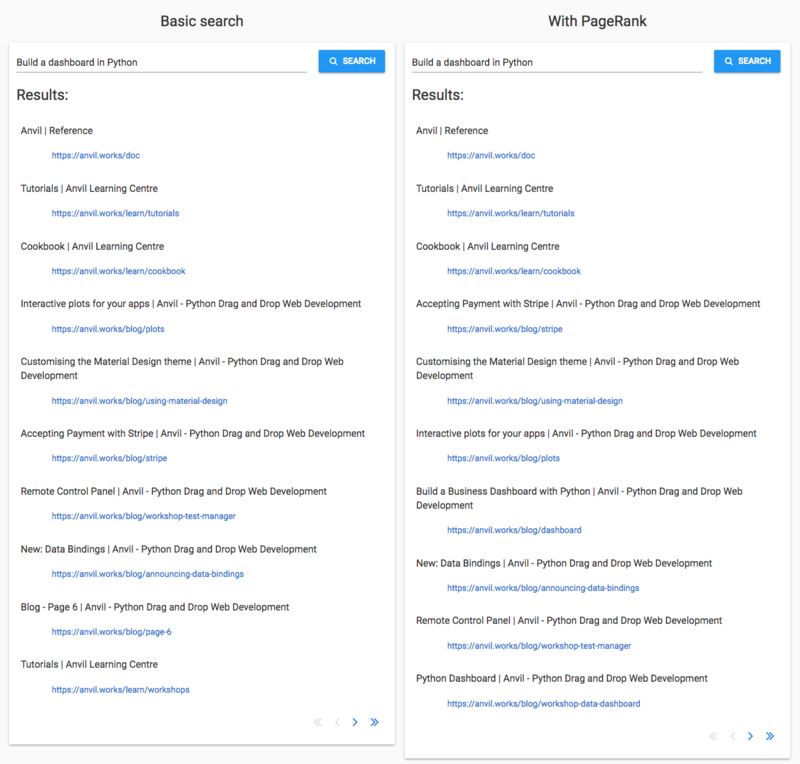 The PageRank search does worse in one respect - the top spot has been taken by the reference docs, replacing the Using Matplotlib with Anvil guide. I’m ranking pages purely based on importance and not on relevance. The reference documentation is clearly ‘more important’ overall than the Matplotlib guide - but not more relevant to a search for ‘plots’. I’m using ‘Uplink’ as an example of a word that’s not likely to be used accidentally - it’s not commonly used in normal speech, so any uses of it are probably about the Anvil Uplink. If you’re not familiar with it, the Uplink allows you to anvil.server.call functions in any Python environment outside Anvil. There are three relevant pages in the basic search results, and they appear in the PageRank results too. They are Using Code Outside Anvil, Escape Hatches and Ejector Seats and Remote Control Panel. Sadly, these pages have lost position to more ‘major’ pages, the tutorials and reference docs. The basic search just presents pages in the order it crawled them, so the ranking is ‘more random’ than the PageRank’s importance-based ordering. It looks like the PageRank search is doing worse than chance in this case, because it’s placing pages that have more backlinks at the top regardless of relevance. We’ve learnt something - even something as powerful as PageRank can be counterproductive in some circumstances. A query with multiple words is harder because it’s difficult to work out which words are the subject of the query, and which words are incidental. I’m using ‘building a dashboard in Python’ to test this. 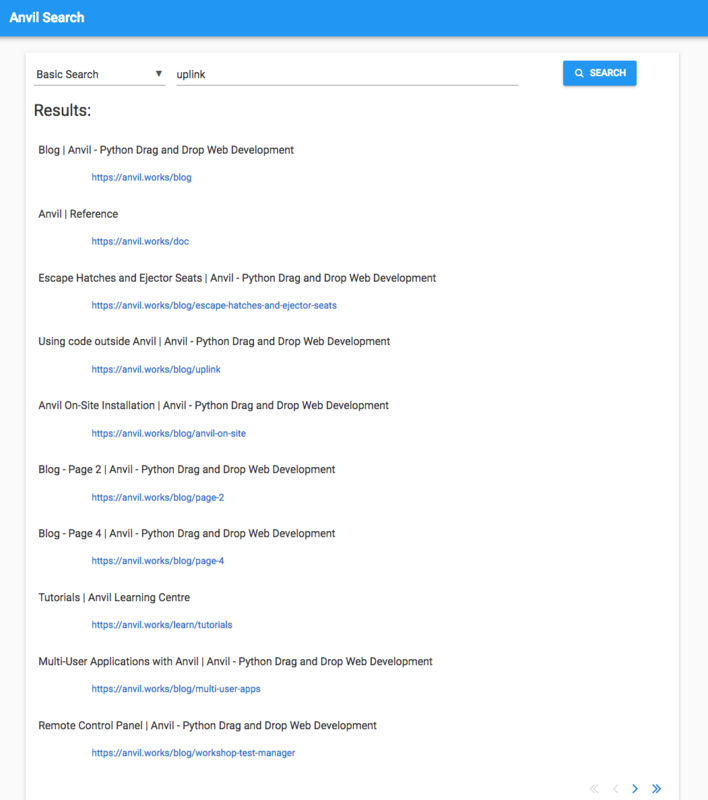 This tripped up the basic search because of the noise introduced by the words ‘building’ and ‘Python’, which are very common on the Anvil site. The PageRank search did slightly better. 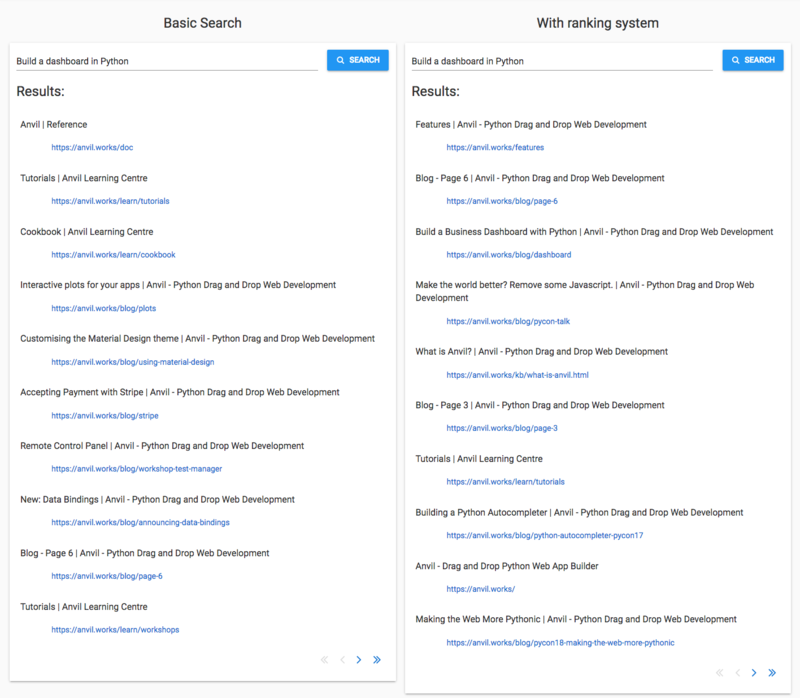 The basic search missed Building a Business Dashboard in Python and the Python Dashboard workshop, but they appear in the PageRank search. Again, some minor pages such as page 6 of the blog are now ranked lower, making room for these better-matching pages. That said, PageRank has put Interactive Plots for Your Apps lower and Accepting Payment with Stripe higher. 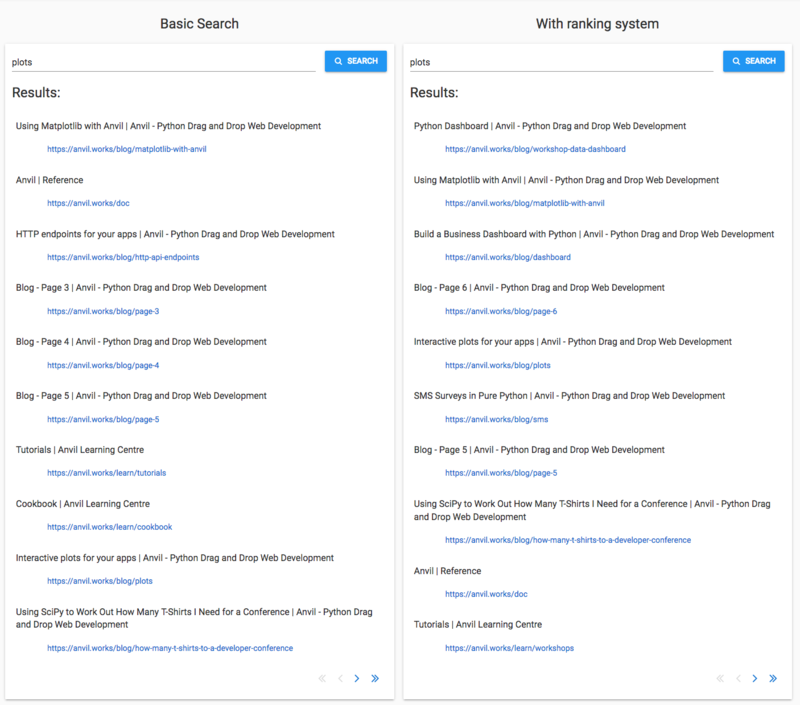 As with the ‘Uplink’ query, the ranking system does not take page content into account, so sometimes the ‘more random’ ranking of the basic search happens to do better. The PageRank search de-ranked pages 2 to 6 of the blog, because they don’t have many backlinks. This made room for other matching pages. Sometimes those pages were good matches, sometimes they were not. It favoured the main pages such as ‘Tutorials’ and ‘Documentation’ above pages that deal with specific subjects. Older pages were also favoured because pages gradually acquire backlinks over time. PageRank is much more powerful when used to choose between sites, rather than pages on the same site. A single site is a curated system where there are only a small number of relevant results. The web is an unmanaged jungle where there will be many sites on the same topic, and PageRank is a great way to decide which sites are better than others. So it’s made things better, but I still need to do more. I need to relate the search rankings to the contents of the page. I’ll take advantage of two trusty Computer Science workhorses: tokenization and indexing. Once I’ve done that, I think my search engine will be good enough to show to the public! 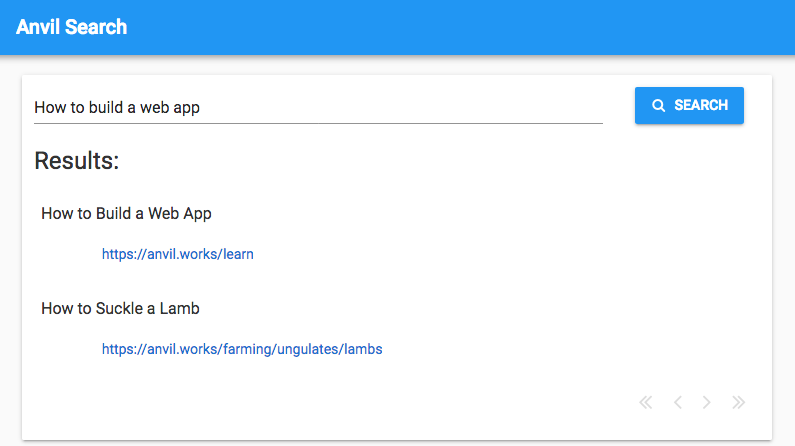 Normally, you don’t need anything except Python to build an app in Anvil. But if we want, we can drop down and customise the look and feel of our page with HTML and CSS. As well as primitives like “text”, “input box”, or “drop-down”, applications have higher-level UI elements that should look consistent. For example, we might want to group our components into “cards”. Likewise, we want all our headings to match each other. To do this, we don’t create new components; we create new “roles” for existing components. A “Card” is a panel component (ColumnPanel) with a border and drop-shadow; and a “Heading” is a Label component with a different font and bigger text. Often pages have common structure - a title bar, some navigation links, etc. 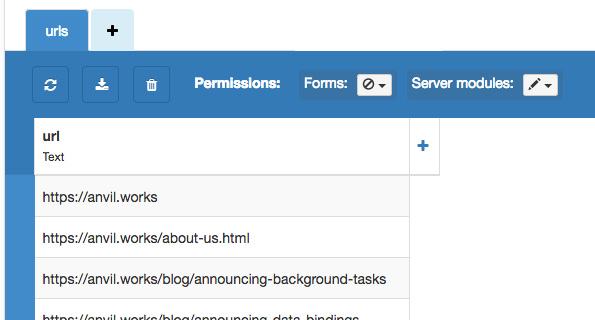 Rather than building this every time with components, our theme can provide HTML scaffolding. This scaffolding can include drag-and-drop points for creating special elements like titles or navigation links. It then typically has space for a standard ColumnPanel to lay out the main page content. To find out more about Anvil, check out our tutorials. For the gory details on how to create your own custom themes that work with Anvil’s visual designer, check out the reference docs. Do you really understand your accounts? Could you build your books from scratch? If you run a business, you’ve probably heard of double-entry bookkeeping. It’s “the most influential work in the history of capitalism”. We “may not have had the Industrial Revolution without it”. It’s kind of a big deal. But, especially if you’re a technical founder, you might not actually understand it. You’re not alone: I conducted a survey of early-stage founders at our co-working space in Cambridge, with companies from 2 to 16 people in size. About 75% of founders said they didn’t understand bookkeeping! It seems that many founders are just mashing buttons in Quickbooks and hoping for the best. But we’re hackers – we can do better than that! If you can write code, you can understand double-entry bookkeeping. And we’re going to prove it, by building an accounting app from scratch. All you need is a little bit of Python. Every financial category in your business is represented by an account. Every financial transaction in your business can be represented as a transfer between accounts. Let’s say my startup has $2,000 in the bank. I then spend $1,500 of that on a laptop. If I was just looking at the money in my bank account, I’d think that money just disappeared. But it didn’t disappear – it turned into a laptop! We can see that the total value of our company’s assets hasn’t changed: We’ve just traded $1,500 worth of cash for $1,500 worth of laptop. The purchase is entered twice (hence “double entry”): it removes value from Cash in Bank, and adds it to Fixed Assets. The entries must always balance, so no value has disappeared – it’s just been moved around. We make an Accounts table, with just a name column. The Journal Entries table does the heavy lifting. It records the date and amount of every change made to every account. To make it easier to check that every transaction is balanced, we group all the balancing entries for a transaction together: We make a table of Transactions with a description for each transaction, and then we link each journal entry to the transaction it’s part of. OK, so that’s the easy part – and this is where most introductions to double entry bookkeeping stop. But we still have a problem: How do we interact with the outside world? As we keep saying, every transaction is balanced – it sums to zero. But a company is not a closed system! Sometimes, you spend money on something and it’s gone. If I spend $500 a month on delicious seasonal treats, that money really has left the company. Likewise, if I make something and sell it, I really have brought new money into the company. But in the system we’ve designed so far, there’s no way to represent that. I could make an account representing “Things Meredydd Ate”, and record my Mini Egg habit by transferring $500 each month from Cash in Bank to Things Meredydd Ate. But as far as our database is concerned, the asset value of the company has not changed: I have just been steadily reallocating our assets from cash to chocolate. This is clearly not an accurate representation of our business. What can we do to fix it? Balance sheet accounts are the accounts we’ve already met. They represent things we own (assets, such as cash in a bank) or things we owe (liabilities, like a loan we will have to pay back – these have negative value). For any point in time, we can work out the value of each balance-sheet account on that date. This lets us display everything we owned or owed on that date: This is the company’s balance sheet. Profit and loss accounts are accounts that represent the outside world. Transactions with these accounts represent income and expenses – that is to say, value flowing into or out of the company. For example, when we sell something, we can think of it as a transfer of money from “Sales” to a balance sheet account like “Cash in Bank”. When we spend money on Mini Eggs and I promptly eat them, that’s a transfer to “Expenses”. For any period of time (eg “last year”), what we want to know is how much money the company has gained or lost from outside, and which P&L accounts it flowed from or to. We add up all transactions with every profit-and-loss account that occurred between the specified dates (eg from January 1st last year to January 1st this year), to get the profit and loss statement for that time period. If you sum up all the accounts on a balance sheet on a given date, you know how much your company was worth (its “book value” on that date). If you calculate a profit and loss statement between two dates, you know how much profit or loss you made over that time period. Because all transactions balance, the total profit (or loss) between two dates is equal to the change in total book value between those two dates. So we can see how much our company is worth right now (that’s the balance sheet for today), and how much it was worth last year (balance sheet for one year ago). And we can see how we got from there to here: where all those gains and losses came from (that’s the profit and loss statement from a year ago until today). And because we’re using double-entry, this is an accurate way to measure profit! For example, buying new laptops for the team might deplete your bank account, but the company didn’t suddenly become unprofitable that month. The P&L lets you see through the noise in your bank account, and understand your actual financial position. Notice that because we’ve gained value from the outside world, the change to the Sales account (profit and loss) is actually negative! This balances the positive change to Cash in Bank (balance sheet). This produces a list of dictionaries, which is easy to display in a Data Grid. And that’s how we produce the balance sheet screen you see above. # is a gain for us, and any money going in is a loss for us. But there is one important difference. Profit and Loss accounts represent “outside the company”, and we want to count how much we’ve gained from P&L accounts – profit should be positive! Because journal entries always balance, we’ve already seen that a gain from Sales represents a negative change to the Sales account. So, to calculate our profit, we start at zero and subtract every change to the Profit and Loss account. That’s it! We’ve built a web-based accounting system with just a few lines of Python. We can enter transactions, and generate both balance sheets and profit-and-loss statements. In this article, we’ve been concentrating on the data-handling code – but thanks to Anvil, making a web-based user interface was the easy part. Should you use this code to manage your startup? Probably not. Use a full-featured accounting system like Quickbooks: it can import transactions from your bank, knows about tax regimes, handles multiple currencies, and much more. And you can still drive your accounting records with code – these systems have powerful APIs. Of course, out-of-the-box tools can’t do everything. Your business will have processes you want to optimise, and common tasks you want to turn into one-click affairs. We build all our internal workflow tools with Anvil – we’ve written accounting tools that use the Quickbooks API to query transactions, record expenses and raise invoices. And now you understand how double-entry bookkeeping works, you’re ready to do the same thing! Many thanks to our awesome accountants, Lucy and David Parry of Parry & Parry, who taught me everything in this post. Any mistakes in here are assuredly mine and not theirs. If you’re looking for accounting services in and around Cambridge or London, we recommend them heartily. What happens when I issue an invoice? Businesses often sell things “on credit”: We give the customer a product, and issue them an invoice. Some time later, the customer pays the invoice. How to represent this? Well, if we’ve issued an invoice, the customer owes us money – so that’s an asset! We record these assets in their own balance-sheet account: “Accounts Receivable”. When we make a sale, we transfer value from the Sales account (that’s Profit and Loss, because we’re gaining value from the outside world) into Accounts Receivable. Later, when the customer pays the invoice, that’s a transfer from Accounts Receivable to Cash in Bank. Note how we made the profit when we made the sale, not when the money reached our bank account. But in between making the sale and receiving cold hard cash, we could track how much money we were owed by our customers. This gives us a lot more visibility into the business than just looking at our bank account. What happens if someone doesn’t pay an invoice? What happens when my laptop wears out? Again, we can represent this as a transfer from the balance-sheet to a P&L account. We typically model equipment as having a “useful economic life”, and spread its cost over that period. We call this “depreciating”. So if we depreciate our $1,500 laptop over 3 years, that means at the end of each year we transfer $500 from Fixed Assets (balance-sheet) to Depreciation (profit-and-loss). After three years, according to our accounting records, the laptop is now worthless. This neatly expresses that “we need to buy new laptops from time to time” is an ongoing issue. We don’t take a surprise loss every three years when we replace our laptops; we spread it out over the equipment’s useful life.